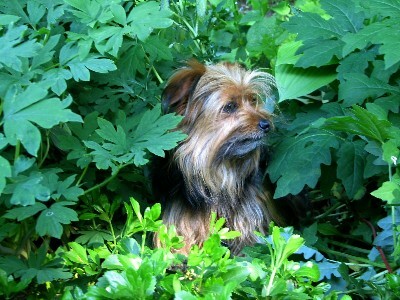 My 13 year old yorkie mix Kibbles is battling brain cancer. We were diagnosed by symptoms, as we had decided that we are not going to do chemo or surgery due to her age, anxiety and homebody personality. Kibbles first had difficulty with balance in October. We took her to the emergency vet and then our regular vet the next day. They thought it could just be a temporary thing that older dogs sometimes go through. She seemed to improve, or at least not get worse for awhile. Then in November she began having periods of rapidly blinking her eyes and small jerks of her head. The balance seemed to be getting a little worse. The vet now diagnosed her with probable brain cancer. I took her to a referral clinic, but aside from finding a couple of pain spots in her back, they really couldn't add anything without surgery. Kibbles is on phenobarbital because the eye blinking thing is mild seizures. They may be mild, but she has many, many a day. She is also on gabapentin for pain. She also has an anti-anxiety med for when we need it, as she gets very frustrated with the seizures and the balance issue. Now in January, her balance has gotten worse, but she gets around pretty well. She has learned to compensate with her posture. A few days ago we started CBD once a day. Our hope is that this will help with the seizures and anxiety more than what she is on already. A wild hope is that it will slow the tumor growth or the spreading. She has already made over the 3 months she was given, and is still happy, so we feel blessed. I came to this site to try to find more info on CBD as a safer, natural treatment. It is a really nice bonus to find this forum of people who have/are going through the same thing.